Boland’s Mills, Grand Canal Dock in Dublin is a well known landmark, located on the corner of Ringsend Road and Barrow Street. As is obvious in the name it is a former Flour Mill which was once owned by the Boland family. Boland’s bakery was located nearby in what is now the Nama Building on Grand Canal Street Lower. Both sites were occupied by De Valera and his forces during the 2016 Easter Rising. The bakery was actually De Valera’s headquarters! The Boland’s Mills site is comprised of concrete silos on the Ringsend Road side, which were built between the 1940’s and 1960 and an older protected brick building from the 1800’s on the Barrow Street side. The mill ceased production in 2001. Since than it has remained derelict. However, soon it will be completely redeveloped into a major new development of offices and apartments to serve the thriving Grand Canal Dock Quarter. The brick building will be preserved. While the more recent silos will be demolished. 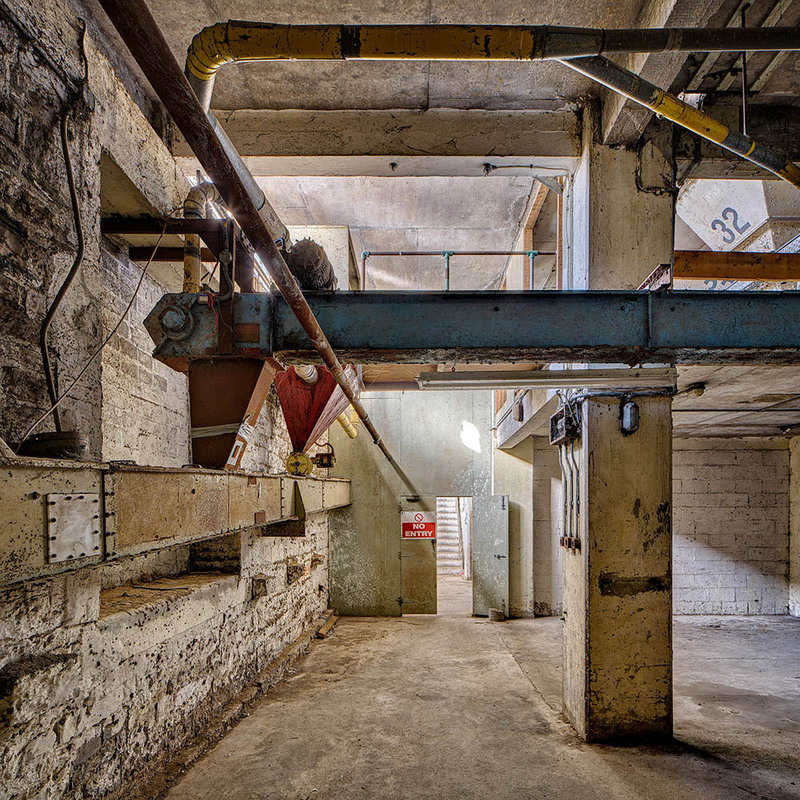 I was delighted to get the chance to photograph a serious of fine art industrial photos of the inside of the site recently before they are demolished. I knew very little about the inside. I found some photos online in my research but it was still pretty much an unknown entity before entering. The place was amazing I have to say. Some of the spaces were like a movie set. From the insane concrete forms in the ceiling, located in the flour store area to the offices frozen in time. I have to say it is the first time I photographed somewhere with surgical gloves. I think every pigeon in Dublin has at some stage frequented the place! I was delighted with the end result and well worth the visit. I love visiting these old sites. You get such a sense of it’s history and the past.